He was a safe pair of hands on the pitch for Ulster and now Bryn Cunningham hopes to continue to be a steadying influence for the province off it. 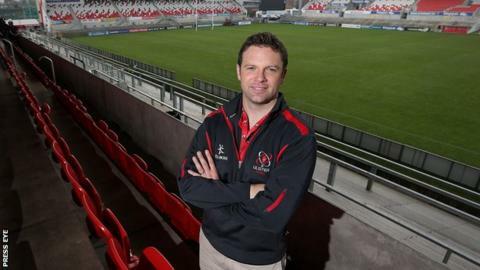 Having played over 150 games for Ulster between 1997 and 2010, the former full-back is now steering things in a different direction in his new role as team manager where he will be in charge of recruitment, contract negotiations and logistics management at Kingspan Stadium. In the four years since his retirement Cunningham worked as a pundit / co-commentator for BBC Sport NI, where he proved more than capable of delivering articulate, succinct opinions on the action going on in front of him. So you know it's less of a soundbite and more of a mission statement when he sums up his own vision for this newly created position at Ulster Rugby. "It's about success on the pitch, yes, but it's about creating a squad that people from the outside want to be a part of, and that people on the inside don't want to leave. It's as simple as that." Cunningham, 36, has spent the last four years working with a sports management agency but is, quite literally, turning the tables on his former associates as he goes from poacher to gamekeeper. "Whenever I retired I wasn't really sure what I was going to do," he says. "My degree from Trinity College (Dublin) is in Business Economics, which is fairly wide-ranging, you could probably go into virtually anything really, and I hadn't really decided because my career finished earlier than I anticipated. "I felt I was still fit enough to go on for a few years but once I got the knee injury, everything came to a halt. "My agent at the time asked me if I wanted to go in with him and I thought, 'well it keeps me involved in the sport' and it was something I was interested in. "I was effectively a sports agent for four and a half years after I retired from professional rugby and what it has done, it has given me invaluable experience and an insight into one of the main areas of this job, which is contracts, so having the market knowledge and the industry knowledge is absolutely crucial. "I suppose you could say I am on the other side of the fence now. I'll be at the opposite end of the table and negotiating with agents and trying to build the best squad Ulster possibly can over the next few years." Cunningham's remit is wide-ranging and a new departure for Ulster. Following the shock departure of David Humphreys as Director of Rugby in June, Ulster chief executive Shane Logan promised there would be no knee-jerk reactions and after a review of the structures at Ulster, it was decided to transform the honorary team manager's role into something more meaningful. With Ireland assistant coach Les Kiss due to take over as Ulster's new Director of Rugby after next year's World Cup, and Cunningham working more behind the scenes, they have created two new roles as opposed to appointing a replacement for the legendary Humphreys. "I wouldn't say his (Humphreys) role has been split in two," Cunningham argues. "Les's role as Director of Rugby is much more rugby-based and much more hands on, which David's wouldn't necessarily have been. "It took Ulster a period of time to decide what structure they wanted because they didn't want to just put in a direct replacement for David. They did a lot of research into what other successful clubs do and what areas needed looked at, so we certainly believe we have a very good structure here moving forward. "The contracts and day-to-day operations of things are the roles that I am more concerned with. "Obviously, success on the pitch is the most important thing, because no matter what field of business you are in, you're judged on results. "Even though I am not a coach and I am not directly preparing the players for their match at the weekend, I still will have an element of responsibility into how that result pans out. "A lot of it is down to building the right squad, making sure the right people are here, making sure the environment is good so we are all working together for the one goal, and ironing out any issues that can potentially develop."